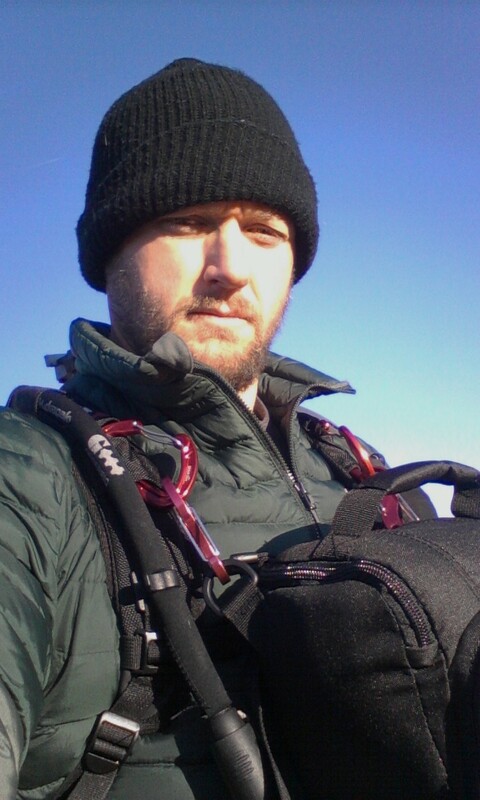 Outdoor Products recently asked me to take a look at their weatherproof backpack, the 30 L Shasta Weather Defense Backpack. 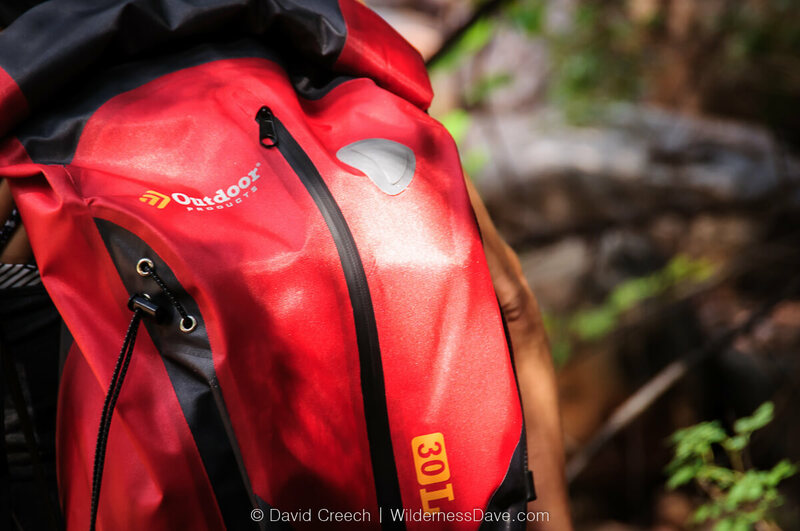 They were kind enough to send me one of the packs so I could put it through it’s paces on the trail, on the water and in the crazy Arizona monsoons to see just how weatherproof this backpack really is. Arizona summers are oppressively hot and miserable with scorching temperatures reaching above 115 degrees in the lower desert. Most of the summer we avoid the heat and head for water or cooler temperatures. Instead of hiking and climbing as we do the rest of the year, my wife and I usually get an early start and head out to the lake for some kayaking and paddleboarding. On the weekends, we’ll head up north and hike in the shade of the pine forests or along canyon creeks. High country or low country, summer is also storm season and I have yet to have a single trip up north that didn’t rain on me at some point. What’s the common thread here? Wet. Kayaking, paddleboarding, creek hiking and rain storms all end up making it a challenge to keep our stuff dry. Enter the Outdoor Products Shasta Weather Defense Backpack. I have a couple of dry bags from my whitewater days, and I’ve picked up a waterproof duffel for my camera gear, but we really didn’t have a casual backpack to handle short day trips with a high potential for getting soaked. Admittedly, the Shasta, at 30L, is a bit big for day trips. The Outdoor Products 20L version, the Amphibian, would be much more appropriate. The Shasta is deceptively huge and can carry a ton of stuff. For a beach day or paddleboarding morning it might be great with extra clothes, beach towels, snacks, etc. all stuffed in it’s generous roll-top main compartment. The Shasta also has a convenient and sizeable front zippered pocket for quick-access items like a phone, map or sunscreen. The zipper is a nice weatherproof zipper that performed well keeping most moisture from contents inside the pocket. The bungee cordage on either side, meant for carrying trekking poles, is handy for quickly strapping other items to the pack as well. We found it convenient to tie down wet shoes that we definitely did NOT want inside the backpack with our dry gear. Poor Merelyn get’s all the glamorous model work when we have something like this to test out. 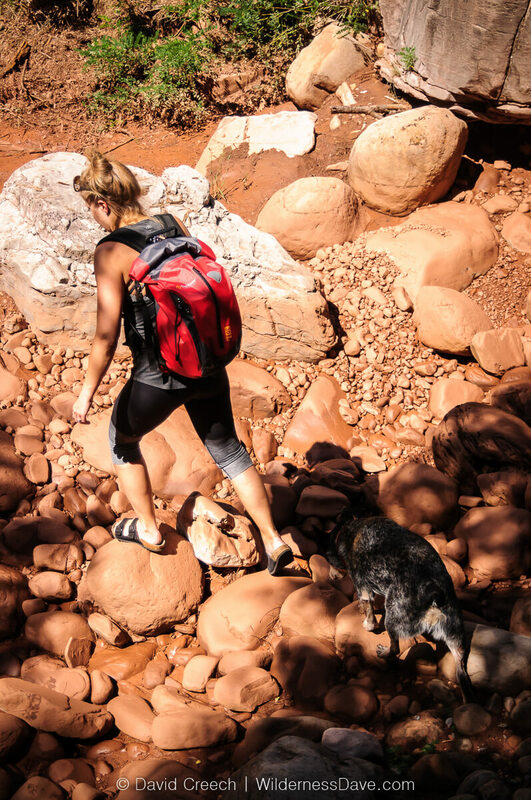 After spending some time on the trail and on the water with the Shasta backpack she was pleasantly surprised at how comfortable it was to carry. Not loaded to capacity we didn’t really test it with a ton of weight, but with a moderate load it sat comfortably, rested well on the back and felt balanced as a backpack should. Even rock hopping in a wet and muddy creek the pack was stable, secure and kept things dry (and clean). 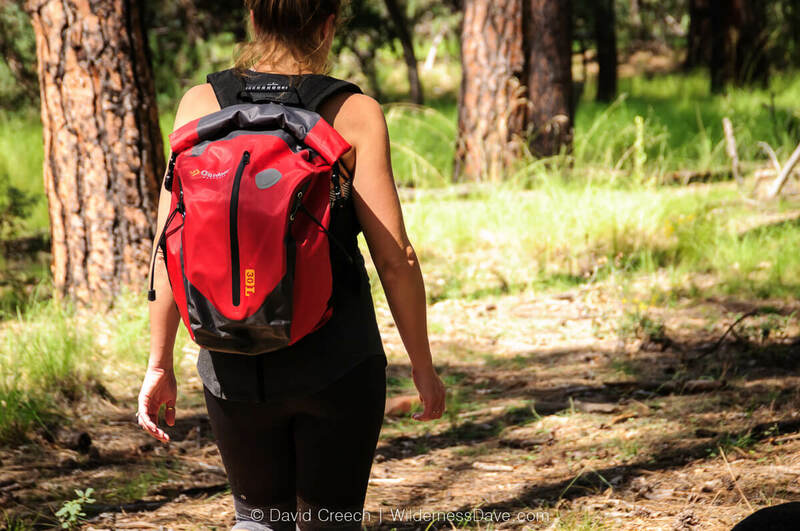 The backpack comes with a removable padded back support and adds some rigidity to the pack and would make heavier, bulky loads much easy to handle. It also comes with a removable waist belt. We removed them both to test out the pack, but they do offer up a bag that truly fits the backpack mold and isn’t just “another drybag”. We spent an afternoon in the high country using the backpack for short hikes and playing along the creeks. I’ve had the backpack with me a couple of times as summer storms set in and was glad to have it. We also took it with us for our lake excursions where it stowed in the kayak, on the deck of the paddleboard and on Merelyn’s back as she paddled. We wanted to push the limits of the bag’s intended function to see how far it’s water resistance would go. The 30L Shasta Weather Defense Backpack is a really nice hybrid of a classic roll-top dry bag and a multi-use backpack. It has all the features one expects from both with little compromise. It’s roomy, comfortable and (when used properly) does a great job keeping the weather out. The TPU coated 420 Denier with welded seems essentially creates a waterproof bucket and it’s well made. This bomb-proof construction means there aren’t a lot of pockets that would require extra seems and there is only one way in or out of this bag. At about $80 retail, it’s a decent deal for a backpack of this size and comparable to a lot of similar sized drybags. Being a roll-top bag it suffers the same limitations as any roll-top dry bag: it has to be full to work. Roll-tops require compression to work properly and make a strong seal against the elements. Like all roll-top bags, if you can’t roll the top tight enough and cinch it down, the roll loosens and water slips in. Being a 30L bag, we had to stuff a lot of gear into this bag to get the roll-top to close tightly. Sometimes, for a short while at least, you can trap enough air inside the bag to achieve a tight closure but it’s not an airtight bag and eventually you loose enough air to collapse the resistance you created. This is important to remember when choosing the bag size. Not a lot of gear, consider the 20L instead. The outside pocket was impressively resistant to water. We had it strapped to the wet deck of the paddleboard as we bounced around in choppy water for a good 2 hours or more before the pocket showed any signs of letter water in. Splashing water and light rain didn’t make it through the pocket, making it a successful and secure weather resistant feature. The hard part here is that the product description refers to the bag as “water tight” and it’s not. Not without a full load in the pack. Anyone who has worked with roll-tops would know this but many people may not. What it IS though, is weather resistant and and nicely designed and constructed. It serves it’s purpose well and, aside from the roll-top, keeps the water out effectively. I put this pack in my backyard pool, careful not to submerge the roll-top, and it successfully keeps all water out. 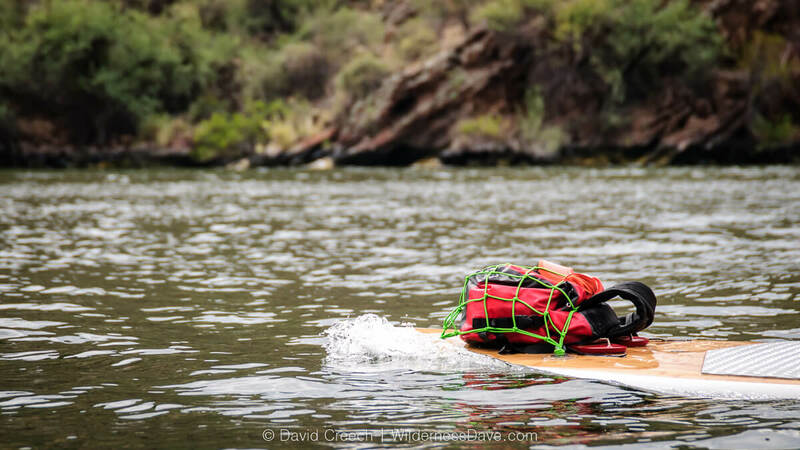 I’d recommend this bag for paddling, canyoneering and backpacking in rainy conditions with complete confidence. Just don’t treat it like it’s a sealed waterproof bag and you’ll be very happy with this backpack.